This stunning Classic Freestanding Dorchester Square Vanity Unit with Chrome Handles in Graphite is part of Heritages stand-alone furniture range and is made in the UK. Features soft closing doors and an 18mm veneered carcass that is crafted from Realwood Oak veneers and solid oak timbers that are from sustainably managed forests. 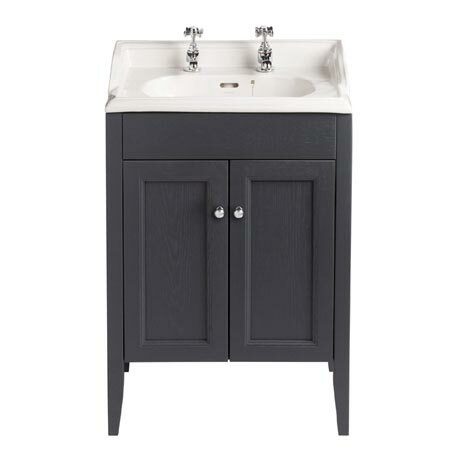 Combine this stylish piece with the coordinating vanity units, cabinets and WC seats available. Comes complete with the option a Dorchester 2 or 3 tap hole Square Basin. Please note: Taps and waste pictured are sold separately.